Not all teenagers are into girly stuff and pretty things. Some are more tomboyish. They prefer activities that are associated more with boys and men. Perhaps, they are more into sports, rugged outdoor activities or even gaming. They also tend to reject the typical notions of being a girl (doing your hair, painting your nails and making jewelry). If the teenage girl you know is more of a tomboy then a girly girl, it may be difficult to find an appropriate gift. But help is at hand, here are 17 gift ideas for tomboy teenage girls. Many tomboys are into sports. If this is the case, this give you a huge clue as to what to buy. What sport does she like play? If she's into soccer what about a soccer ball, tickets to a soccer match, gear for soccer (boots, socks, kit etc). If she will wear some jewelry you can get soccer themed jewelry (rings and pendants). There are tons of themed soccer gifts. The same kind of ideas can be applied to lots of other sports too. Basketball, volleyball, running - whatever she is into there is equipment and other themed gifts to be bought. If she is into her fitness and sport she may appreciate an activity trackers such as the fitbit one wireless activity plus sleep tracker featured opposite. This fitbit tracks steps, distance, calories burned and stairs climbed. It also monitors how long and how well you sleep..And you can use it to set goals, view progress and earn badges. This fitbits also has heart rate monitors and smart watch features too so it may be worth checking them all out to see which one is best suited for your teenage tomboy. Just because she is a tomboy doesn't mean that she won’t like new clothes. But, her clothes are more likely to be hoodies, jeans and t-shirts, perhaps combined with some converse pumps. Avoid anything overtly girly like heels or sparkles. She may like accessories such as a beanie hat and other practical stuff such as a scarf or sunglasses. Whether a teenager is a girly girl or a tomboy it’is often difficult to buy clothes, so a voucher may go down well or a shopping trip. If they are the sporty type, some new shoes for the sports they partake in can make a great gift. The Brooks Women's launch featured have a wide range of colors many of which are gender neutral so make a great gift for a teenage tomboy who's into sport. These adidas training pants are super comfortable and great for both casual wear and sports wear. ​They features ventilated climacool which keeps you cool and dry during exercise, training sessions or activities such as hiking. If she is the kind of tomboy who likes to spend time outdoors hiking or camping, outdoor gear is often a very good choice. If she needs it perhaps she would like a tent or sleeping bag for her outdoor expeditions. One consideration is a swiss army knife. These can be really practical for time spent hiking and camping with. You can get versions with everything you could possibly imagine on it from wood saws, to bottle and tin openers, to wire cutters to screwdrivers. If she plays soccer this is a great way to practicer her skills. It's a solo trainer. You attach the band to your waist and the ball at the end of the rope. You can then practise all kinds of passing and shooting techniques and improve receiving the ball. It's great for all levels and fits different ball sizes (sizes 3, 4 and 5). Fantastic for honing those skills when you have nobody else to play with. Check out 20 more soccer gift ideas for teen girls. If she is a tomboy who does a lot of sports, swimming or exercise a sac pack may be a great gift for her. She will be able to use to carry all her atheletic clothes and a water bottle. It's lightweight so it's easy to carry and transport. It's also good for carrying a packed lunch and extra clothes for a day out or trip. It makes a good travel bag as well. The sackpack features one large compartment with drawstring closure, two mesh pockets and a front zippered pocket. If she is a bit of an adrenaline junky would she appreciate the opportunity to take part in some extreme sports. Some ideas include paying for them to do a bungee jump, water sports such as canoeing, abseiling, rock climbing, ultimate zip wires, surfing, snowboarding or zorbing to name but a few. If she already partakes in some kind of extreme sport perhaps down the lesser end of the scale like skateboarding or moutainbiking, you could get them some gear for their hobby. A new skateboard or mountain bike would almost definitely go down well. Even things like knee elbow pads or helmets may be a winner. The Ripstick Castor board is a cross between skateboarding and snowboarding. It can be used to get around but you can also use it for tricks so it's good to take to a skatepark and enjoy on the ramps. It's lots of fun to have a go, if there are siblings and friends who are around they will be queuing up to enjoy as well. Some tomboys like hobbies such as photography. This can give more clues as to what to buy. If you have the budget and she doesn't have one, an SLR camera could be a good choice. She may appreciate a camera which she can use underwater. There are also lots of accessories you can buy for people who like to take photos. Some examples include a tripod for an SLR, a bag for their camera equipment, a subscription to a photography magazine, a lesson from a professional photography as to how to take photos or perhaps some blown up posters of their favorite prints. Another idea is an action camera. An action camera could be a good gift for both a photographer or a tomboy who may partial to shooting some video of sporting activities or adventures such as hiking and camping. The camera is designed to film action. You can wear it (using a head or a wrist strap) or attach it to a piece of equipment such as a bike. Then film the action. It can also be used to film other things such as parties, time out with friends, music concerts, special occasions or just everyday life. It’s waterproof so you can take it with you to film watersports, swimming or snorkelling. ​The camera is also small and lightweight so easy to pack up and take with you wherever you go. It simple to use. The video and pictures it take are excellent and it has outstanding audio quality too. It also has buit in wi-fi so you can share your adventure on the go. An indoor basketball hoop. This can be fixed onto the back of a bedroom door so you can always shoot hoops whenever you are in the mood. An adult lego set. There are quite a few lego sets that are aimed at teens and adults. You can build a lego model of the Whitehouse, or why not investigate Lego mindstorms (expensive lego robotics kit but great for all lego fans). A drone with a is a fun toy. The drone featured is a good one to try if she has never flown a drone before. It's inexpensive so she can see if she enjoys it and if she wants to take the hobby further. It also can perform cool 360 degree flips. Google cardboard is a really affordable but effective way to try out a virtual reality headset. Place your phone into the back of the viewer, and view content through the lenses. It works with cardboard compatible VR apps and games allowing the user to experience an immersive environment. Thousands of VR apps, games, and videos³ are available to surround you in the experience, making you feel like you’re really there. If she is active and likes playing outdoors consider a spike ball game set. Spikeball is a fun, active, and competitive (if you want it to be) 2 on 2 game played with rules kind of like volleyball. If she's interested in using her hands, cars, engines and motors this is this build-it-yourself big engine is one to consider. It has the thrills and sounds of a real V8 engine. This kit will allow you to discover how an engine works by constructing a fully working model. It features an electric motor with illuminating spark plugs and ignition sound. You don't have to be a tomboy to love laser tag, but tomboys will almost definitely love it. Laser tag is a great game for kids, teens and adults of all ages. The set featured has 4 guns, target vests, a night vision mode, invisibility mode and a 150 feet range. Great for turning your back yard into a lazer tag arena. There are some cool gifts you can get for a tomboy’s room too. Again avoid the throw pillows and girly bedding. places for her and her friends to chill out such as a gaming chair or bean bag chair. A bluetooth alarm clock speaker will allow her to stream music from a device such as smartphone or tablet to her speakers. And she will be able to wake up to her favorite songs. Personalize her room with framed pictures of people she is close with. Or if she is a music fan she might like a framed picture of the band she is into. ​A cool night lamp is another idea. If she leaves her laundry lying all over the floor, this laundry punch bag may encourage her to pick it up! As you can see, the laundry bag is designed to look like a classic punch bag. It's big enough to hold a heavyweight load of washing. It's highly durable and resilient so perfect for punching too. There is a drawstring at the top to help conceal odours, great if she has lots of sports kit to wash. There are lots of media streaming devices available such as Apple TV and Roku which will allow her to have access to lots of TV and music channels on the television in her bedroom via a wifi connection. One of the most popular media streaming devices is the Amazon Fire TV featured. It's simple to set up, just plug it in to the televisions HDMI port, connect to wifi and start watching. It can get extra channels through the TV through services such as Netflix and Amazon Prime. The really great thing about the Amazon Fire TV is that it has a voice control. So you can launch and control content with the included Alexa Voice Remote. Simply say, “Play........ (name of movie/TV program)” or “Launch Netflix” and Alexa will respond instantly. Plus, play music, find movie show times, order a pizza, and more. If she likes to listen to music it's worth looking at the range of bluetooth speakers that are now available. She could have one for her bedroom to listen to her music. A bluetooth speaker will allow her to stream music from her phone or tablet to the speaker without wires. The great thing about many bluetooth speakers is that they are small lightweight and portable so can be carried from room to room or to a friend's house really easily. How much you spent on a bluetooth speaker will normally determine the quality of the sound output. The speaker featured in the article is a mid range speaker and has excellent reviews. Another really cool toy that she hang onto her bedroom door is a mini basketball hoop. It's easy to hang with pre installed door hooks. Lots of fun to shoot some hoops when she wants a break from her homwork. Also good to have a go with friends when they pop round. The hoop has protective foam padding on the backboard and brackets to protect the door as well. A bed rest is a great item to have in any bedroom or for use around the house. It gives great supports when looking at a laptop, reading or watching television when sitting on a couch, the bed or floor. It has a carry handle so is easily transported around the home to wherever you want to use it. The bed rest arrives flat packed but it fluffs up and gets it shape in the next 48 hours. Then it has a guarantee for 3 years use. This is a cool book for the girl who likes to experiment and enjoy practical projects. Backyard Ballistics contains lots of ideas of weapons and other items you can build using common items, many of them found around the house. For example as it says on the front cover "Build potato cannons, paper match rockets, cincinnaiti fire kites, tennis ball mortars, and dynamite devices. The book encourage a lot of creativity as is therefore very educational as well as being fun. Also a good choice for those adults who still want to be a big kid. There are lots of cool gifts you can give her to help with her studies. A lapdesk is great for studying on a couch or bed or wherever you are on the go. It's great for teens to use at home and for them to take when they move onto college too. There are many lapdesks of varying sizes. The lapdesk featured includes accommodates a 17 inch laptop and has a phone holder and a built in mouse mat. There a dual bolster cushion underneath which conforms to your lap and keeps you cool and comfortable. The boogie board is a writing tablet. It's great for students in that she can scribble her homework or study working outs as she studies. It's also fab for writing to do lists, shopping lists, leaving messages for family and friends around the home, taking telephone messages or just doodling. The image or writing will stay as long as you need it to. When you are ready it can be arranged at the touch of the button. You can create again and again without the need to connect. It's good for the environment and it saves paper too. A space pen is a really useful and practical and is a pen she won't want to loose. This pen can write on any surface whether that be writing against a wall, on a paper pad or even upside down. It doesn't require gravity for the ink to flow, hence the reason why it can write in space. It also works in extreme temperatures. When closed, the bullet space pen is the perfect size to carry in your wallet, pocket, purse, car glove box or organizer. ​When open it's a full sized, evenly balanced writing instrument. There has already been some extreme sport experiences that have been mentioned in the article. 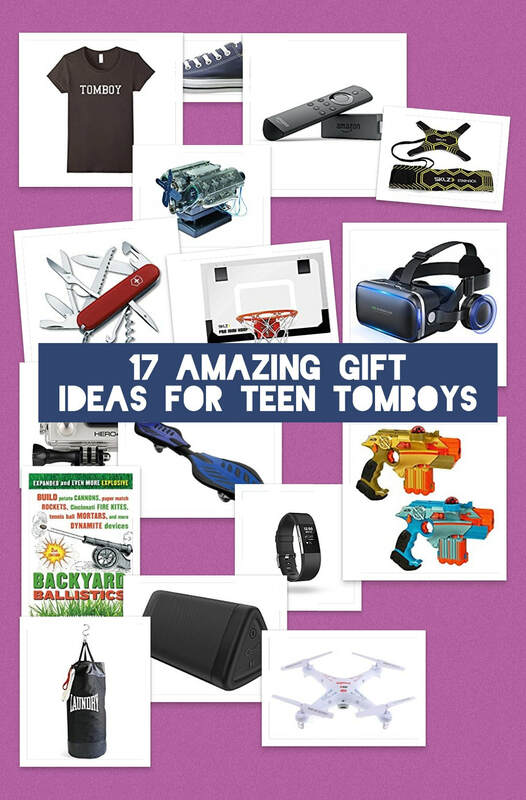 But there are lots more ideas of great experience day gifts for teenage tomboys too. Ideas include a martial arts lessons, go karting, horse riding, music recording day, a helicopter or hot air balloon ride or quad biking. If they like music it makes it a bit easier to find a gift too. If they are interested in learning to play music, what about a guitar with lessons or a book on how to teach yourself to play the guitar. A drum kit is another idea. If they like listening to music, what about tickets to see their favorite band in concert. You could also get new headphones or speakers for their room. If they're proud of their tomboy status, they are some fantastic t-shirts with some great slogans. You can't go wrong with a simple tomboy slogan. The t-shirt featured comes in different sizes and colours. It's lightweight and offers a classic fit. ​Great to wear with jeans. If all else fails you can always go for vouchers and money. But avoid Fashion 21 and Sephora. You could consider cinema vouchers or itunes vouchers. Or get them vouchers for a sports or other shop they may like.